From the Summer 2011 Collection "Nice Stems!" is the soft pink Play the Peonies. 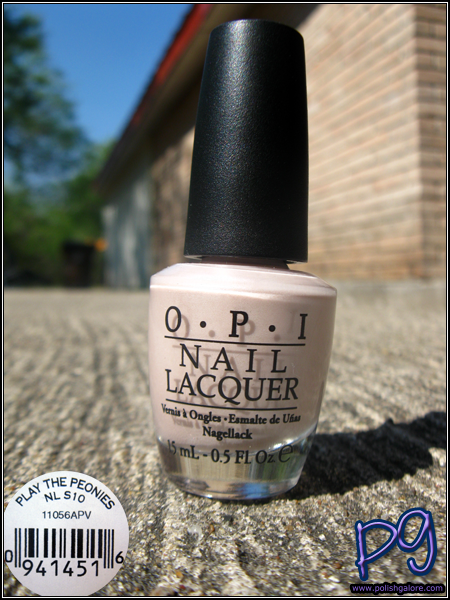 It's a very light pink with a slight shimmer to it. 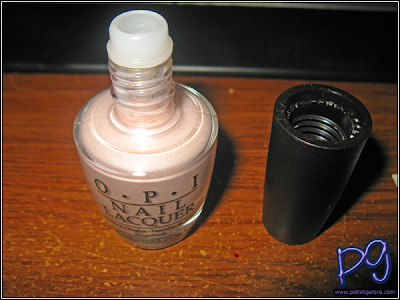 I used a base coat of OPI Natural Nail, 2 coats of polish and a top of OPI Top Coat. As soon as I opened the cap however, I was met with this. Lovely, eh? I just had to push the white cap (where the brush is stashed) into the very top of the black cap. It was a bit messy because of the polish on the brush but I lived. As you can see in the sun, this color doesn't like to hide my wretched ridges. I definitely need to stick to a ridge filling base coat. Sorry about that! This is a light pink as previously mentioned and the silver shimmer is a hard to see but it's there. In the shade, it's a bit darker but almost more pearly looking than before in the sun. The shimmer is also a bit hidden here. Finally indoors with the flash and you can see that shimmer (finally). I definitely need to get a manicure soon so my nails can be shaped and cuticles can be fixed. Enough about my nails... this color is nice but kind of blah for me. I've never been great with light pinks - it's just a bit boring for me. This collection included "I Lily Love You" which has some flakies but I didn't choose to layer it on this manicure.